Pregnant women should avoid eating orange roughy. 2 What Is the Origin of Tilapia Fish? 4 What Are the Health Benefits of Red Snapper? Orange roughy is a bright red fish with a blue belly. Also known as a slimehead, roughy is a deep ocean fish with a lifespan of nearly 150 years. The longer a fish lives in the ocean, the more mercury it absorbs, which is why the orange roughy makes the list of high-mercury fish. When it comes to your health, the safe consumption of orange roughy depends on a number of factors. Mercury is an element that occurs naturally. It also occurs unnaturally as an industrial byproduct. Mercury gas enters the ocean, where it is transformed into methyl mercury and absorbed by fish and other small organisms. 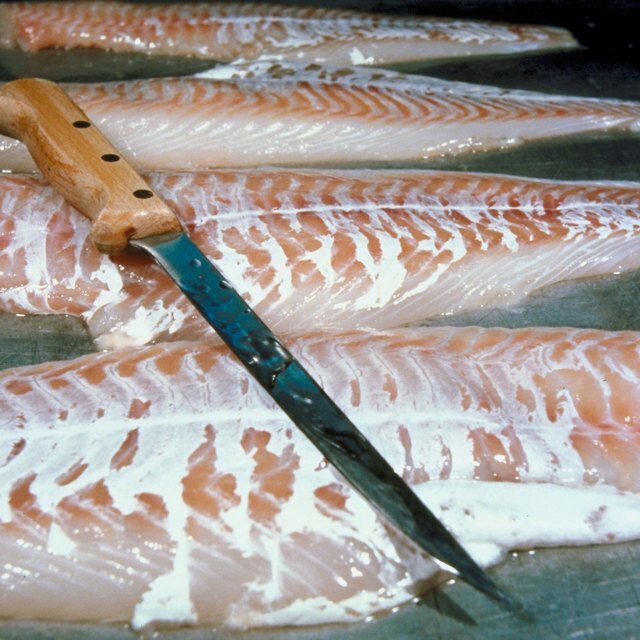 Some fish absorb higher amounts of methyl mercury than others. Orange roughy is a fish that averages high mercury levels -- between 0.265 and 1.120 parts per million. Consuming large amounts of orange roughy can cause mercury to accumulate in your body, resulting in neurological problems, according to the U.S. Food and Drug Administration. Because of the health concerns surrounding high-mercury fish like orange roughy, the FDA advises pregnant women or women who are planning to become pregnant to eliminate these fish from their diets. According to the American Academy of Pediatrics, it is safe for children and nursing mothers to consume high-mercury fish in small amounts, preferably no more than one serving per week. The average adult serving is 4 to 6 ounces; a child's serving is less than 4 ounces. Mercury restrictions for adult men and women who do not plan to become pregnant are just as stringent as those recommendations made for pregnant women and children, according to the Department of Human Nutrition at Kansas State University Research and Extension. Its advises that adults can safely consume one serving of orange roughy per week. Overfishing has led to a severe decline in the orange roughy population. In fact, commercial fishing has led to the total extinction of the orange roughy in some areas of the world. Considering that the orange roughy does not mature until it reaches at least 20 years of age and has a lifespan of more than 100 years, the World Wildlife fund reports that it may be difficult to recover from such depletion. While it may be safe for you to eat orange roughy in moderation, the process that gets this high-mercury fish to your plate appears to be detrimental to the species. Can Eating Salads & Fish Make You Lose Weight?